This remarkable orchid is endemic to Mount Kinabalu where it grows in wet evergreen forest above 1000m. 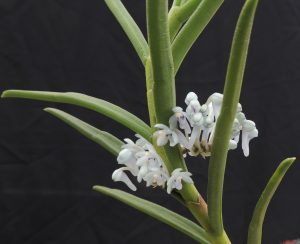 The species has striking greyish, blue flowers with a purple anther cap and field observations show that the flowers are ant pollinated which explained the clustered flowers on very short spikes. We grow the species in small baskets from which the plants grow in a relaxed upright fashion. Plants seem very at home in our warm asia section with a minimum of 17C in some shade amongst other species native to the amazing forests of Kinabalu.